Editor’s note: The following letter was written by a woman who posts as “Sam.” And to answer her question at the end, it sounds like she’s been involved with a series of sociopaths. It all started for me around 11 years ago when I first met what I thought was “the love of my life” and the only man I would ever consider settling down with—up until only months ago. I was only a young 16-year-old girl and he was 21 when we first started seeing each other. I had a rather unstable childhood where I witnessed domestic violence from a very young age, and I left home before my 15th birthday. I did not have the best parental guidance. After leaving home I was living from house to house. I had no job to support myself and I attempted to continue my schooling, with little results. Anyhow I dropped out. Looking back I have no idea how I got by but somehow I did. I also suffered from depression. Then I met what I would later call the love of my life. I had just come out of my first serious relationship with a guy who was physically, verbally and mentally abusive towards me. I later discovered he was abusing drugs. So as you can imagine how lost and confused I would have been feeling at such a young age. I ended up in the arms of what felt like my knight in shining armor. I felt like we hit it off and we stuck together like glue. I felt safe with him and we had so much fun together. He was very protective over me, or territorial I would say now, but it felt good to me at the time, especially after coming out of my previous relationship. He wanted me to commit to something more serious relationship-wise with him, after only a few weeks of being involved with him. But I could not bring myself to. After being in my previous relationship I had too many hang ups. Anyhow after an intense few months of seeing each other, I decided I needed to move on with my life and move out of town and try to discover myself, which meant we would have to go our separate ways. He still pushed for me to make the commitment of being in a more serious relationship. But we ended up in different states and life goes on. We eventually both ended up in new relationships, but he would call me from time to time, trying to convince me to move to where he lived. He wanted me to leave my boyfriend and he said he would pack his girlfriend’s things and she would be out the door like she meant nothing to him. I did not agree to this, but he just never gave in. I really believed that I was the love of his life and he just could not help his feelings for me. As the saying goes, the heart wants what the heart wants. But it just didn’t feel right. Anyhow we both stayed in the relationships we were in and I had a baby with my partner, and he had a baby with his partner. 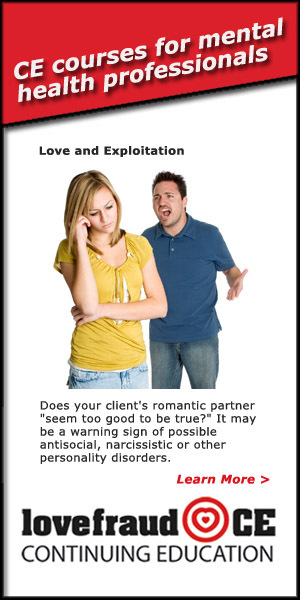 This particular partner of mine was very controlling and did not like me having friends or a job. He was extremely insecure he would go through my phone, read my messages, and stand around listening whilst I was talking on the phone. He would follow me places, very stalkerish behavior. I felt invaded and smothered. After him showing little interest in our baby, I decided I had to get out. Not having so much luck in the relationship department. I was almost 20 and I went out to celebrate my birthday in my hometown. I ran into my old flame, and that was that. We were right back to where we had left off. It felt so great to be in his company again. Anyway, I had to go home. We exchanged numbers and it wasn’t long until he started persisting to get me to move in with him, into his house, as he and his partner had apparently split also. It took a lot of convincing, but after spending a few romantic getaways, one place being a beautiful island holiday destination, and plenty of pledging his love for me, I broke and thought, what the hell. But I felt like things didn’t really add up. Always my instincts told me it didn’t seem right, because he had all his ex’s belongings in the house. When I questioned him on this, he told me that he would be shipping her belongings to her soon. He assured me it was over and she was nowhere to be seen, so I thought it must be the truth. He said they could not get along and she was just crazy. I later discovered she was pregnant with the second child and that is when I should have just walked away. But still he had me convinced that there was never going to be anything between them again. He had made a mistake with her and that he would be open and honest with her about us, but in time. He had me convinced we were getting married. We were making wedding plans etc. Eventually he just walked away from me and went back to the mother of his children. He changed his number and I didn’t hear a word from him until about 8 months later. It left me dazed and confused. I still loved him deeply. When he contacted me again, he was begging for me to forgive him and said he loved me and wanted me to fly to where he was. He said he only went back for the kids, but he said it was over again. I foolishly agreed to meet him, as I think I still needed to make sense of what had happened and thought what we had was deep. He always knew exactly how to get inside my head with his charm and I would believe him. This cycle repeated over and over again for another almost 7 years. I now have a 7-month-old baby to him, and yes he left me. I spent most of my pregnancy in a women’s shelter. He has become a cruel, cold-hearted man. It’s as if I have no further use to him and I am being disposed of. I would assume this is what he did to the other poor woman. I now know it wasn’t her who was crazy. I have found out she is pregnant to him again, but he is keeping it from me. He has threatened to ruin my life if I speak to his mother. He obviously doesn’t want me saying anything or he will be caught out. These are only a few details of what happened in this twisted cycle of hell. I could write a book about it, but I’m sure you can imagine the kinds of things that happened in between. I had no idea sociopaths even existed up until only a couple of months before I gave birth to my second baby. If only I had known back then what I know now. I wonder if my other partners were also spaths. It makes sense to me now how I got involved with these twisted individuals. I am so sad I wasted so many years on believing in something that was an act all along. The one person I trusted most turned out to be my silent enemy plotting against me. I think if I knew the signs I may not have been hooked so hard. But something tells me he will always be somewhere around. And he is far from the charming, funny, loving man I once knew. And he still continues to get away with his destructive behavior. First of all, let me just say what a resilient woman you are. You have been on your own since you were fifteen and you have come so far. Yes, you were groomed by your upbringing to entangle with these sociopaths, but you got out. That is the important thing to remember. You are free to begin the healing process and THANK GOD you found Lovefraud. This is a great place to start. Your story has a familiar feeling to me. I know what it’s like to be completely thrown when you discover what you thought to be true deep in your soul turned out to be a lie. Looking back it is obvious, but when you’re going through the experience it is difficult to see what is happening. I wish you all the blessings that healing can bring. Continue on this positive journey no matter what. Knowledge is power so research, research, and research some more. 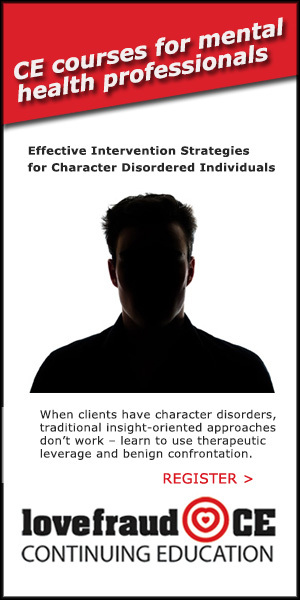 It also helps to speak with a professional who understands personality disorders. Still so impressed with how far you’ve come all on your own. Just wanted to say a special thankyou to you for your kind words I really appreciate it. You are so right all I have been doing is researching ever since and it has helped me so much I think also once you get it you stop questioning and blaming yourself and wondering where you went wrong so it has been very helpful for my healing process. 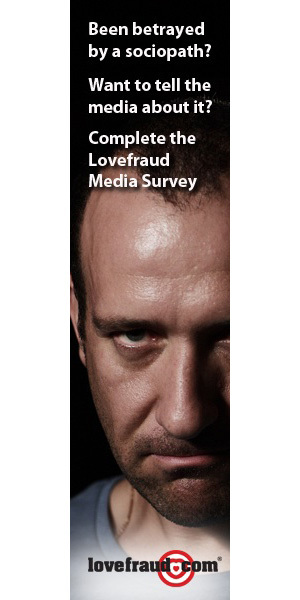 Yes lovefraud saved me. Many blessings to you also. Peace and happiness. What happened is he either threw her out or she left after a fight. 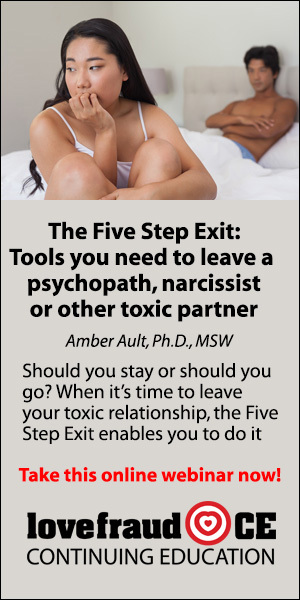 They go from one relationship to another, keep in constant contact with their ex. And everybody is crazy except him. We could write the same book. ThatGirl, You nailed it one word : CONTACT . We lived in the same neighborhood and went to the same college, so we would bump into each other with just a nod or hello, nothing more than an acknowledgement. I re-met the spath at the beginning the spring semester when we had enrolled in two of the same classes. After a few weeks he asked me to see a movie, one that was relevant to a class. It was a nice afternoon, 2 college kids that knew each other more than 10 years ago, seeing a movie for a class. The next week asked me to see another movie and take a walk around the city followed by a peck on the cheek; casual and light. On the third date, at what would be called a ‘casual dining restaurant’, during the course of the dinner he proposes. Ahhhhhh! I laughed it off, but was completely taken aback. For me however there was really no way to avoid him. Same bus to college, same classes, and he knew where I lived since childhood. 5 years, after being blackmailed (although in today’s world, my son tells me that people text and post more explicit on social media), badgered, and just be worn down, I married him. It’s strange, I knew him on and off for 47 years, he has been dead 4 years November and I can’t remember what he looked liked. He had an all grey ponytail, brown eyes, glasses, and got heavy. He cut himself out of all pictures before he died, he left no photographic reminders. It’s unfortunate that it took you 7 years to learn about sociopaths. But at least you figured it out, and you are still very young. Some people stay with sociopaths for 20+ years, and there are some who never figure it out. It wouldn’t surprise me if there were also more women in his life. They have no morals or scruples, and they are very good at hiding their extracurricular activities. But one thing is that the “gut feeling” is usually pretty reliable. 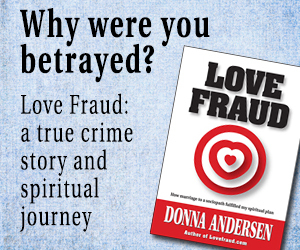 I knew something was amiss when I first met the sociopath I dated, but I dismissed the gut feeling because I was wanting love so badly and wanting so much to trust someone – I couldn’t have misplaced my trust any more than with him. I still want very much to have another person in my life I can love and trust, but I have to learn to walk before I can run, and this is by truly loving myself. I still don’t completely trust myself to take care of myself, to speak up for myself, and to value my own feelings, to set appropriate boundaries, and to be assertive rather than passive, passive-aggressive, or aggressive. I am so glad that you are out of the situation for good. Don’t go back, he speaks with a serpent’s tongue. You sound like you are even tempered and you are grounded in life even though you left home at a young age and had no support system. The best thing you can do for you and your children is to love yourself fully and completely. You don’t need someone else to fill that need. When your at your healthiest is when you make the best decisions on whom to allow into your life. I’m so sorry that you were involved with such a destructive person. Not all men are like that but I think that it’s hard to find a completely healthy man. That has been my experience. Hope you and your children have great years ahead! The more I hear about sociopaths and read the stories the more I realize just how many of those relationships I have been in. I can count three, 2 marriages and one 2 year long affair. I am over 50 years old. So glad you realized it before you were older! 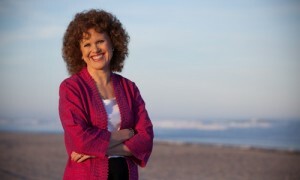 My son was exposed to a lot of unhealthy dysfunction because of my choices. Now I know I did the best that I could at the time but wish I could have learned earlier. Sociopaths don’t always present themselves in the same sort of way. Mine were all three different in personality. They all fit the profile but in different ways. So be careful of anyone who seems to be TOO wonderful, moves too quickly or that other people warn you about. LISTEN to them! You are a survivor!Hold your head high! I remember trying to ‘make sense’ of the crazy-making.It does keep you confused and keep you stuck in the mire.It’s so enlightening to learn about sociopaths and their behavior… to finally understand what happened!It’s validating too—because there is a reason we felt the way we did. Take care of yourself and your two beautiful children! Thank you for sharing your story. You have helped others by sharing. These people are like robots and when they need their battery charged, they will use real humans to get it charged. The more you learn about sociopaths as you read and write here, the stronger you will get whatever choices you make as you go along. That’s right. They keep ties from a distance with as many women as they can, so they always have a place to land when they dump someone or get dumped. People are not people to these types. They are sources, things to be used and disposed of. Every day, tell yourself that you are worth so much more. Just because someone throws you away, that doesn’t mean you aren’t a diamond. It means he was a dysfunctional idiot who didn’t know how to love or value another human being. Thank you for posting your story. I was disposed of too and I feel for you in how much this hurts us inside. It made me feel worthless. Ofcourse, he told me I was wonderful in the beginning. I am still very raw and fresh from my time with him, but all the wonderful people on this site are a wealth of affirmation and comfort. And knowledge. I had no idea what I was involved with until I found LF. I think finding this place was the first blessing to come out of the biggest disaster of my life. Hugs to you and your children. Atleast you are both away from him. A new beginning, where you have a chance for a happy and bright future. I wonder if the fact that we begin to stick up for ourselves actually gets rid of them rather than thinking we just got disposed of? 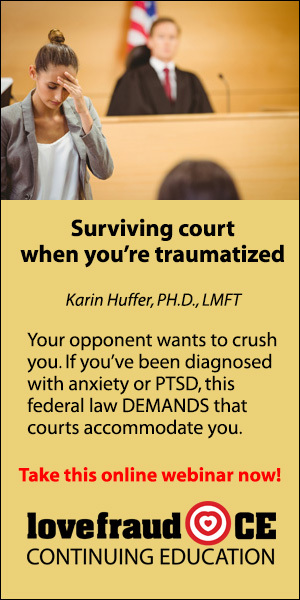 I am wondering that because this thread of posts and the article reminded me that just before my first divorce from a sociopath, I had read a very popular book about how to respond to verbal and emotional abuse. The book made me recognize that I deserved to be treated right. So, I began to use the suggested techniques in the book to stand up for myself. Sociopaths don’t like that! As I continued, I really just pushed him out of my life by accident because he was not going to change and he saw that I was showing strength in courage to his face. At that time, I belonged to a 12 step group for friends/family of addictive people. As I was standing up for myself and he was “disposing of me,” I called a much older woman one day crying. I told her that I believed he had another woman already and he was just leaving me behind like I was nothing. She said, “Oh Honey. THEY never leave us. WE leave THEM.” It truly helped me at the time and now, nearly 20 years later and having just read that same book again, I can see she was right. My inner strength and need got him to move on because he was making me sick. My finally speaking up for myself in appropriate ways I had learned in the book made him need to look for someone who hadn’t figured out yet that she had that right. Maybe, once they see even a glimmer of our human resilience coming back into us, they must move on to a new victim and they know it before we do. I definitely believe that they don’t like it when we start to stand up for ourselves as they have to be in control and if they can see they are losing the control its enough to anger or frustrate them so they will in some cases fake the end of the break up to see if we will get back into line and obey because alot of the time its another way they hope to gain even more control over us they see it as a weaking mechanism. I do believe it is just all one big game and we make the choice to play the game or not so I agree with what that woman said to you about they never leave us we leave them because they always come back for more if they know we are still sucked into their crap they can play with us and use us a little more. On the flip side they know when we are finished or have figured them out but it doesn’t necessarily mean they won’t try from another angle. I think no matter what we are disposed of because they are using us for something and when we finally make the decision to not play anymore they don’t care they just find someone else who will. Either way thats how we end up feeling. I think your statements about them coming in at with different angles are important to remember. Mine certainly does that. It is like watching a computer/robot searching his memory grabbing at what computation might work. In the past, I have been scared about money and the idea of having to find a new room mate. I would stay in his room and talk for hours trying to turn it around to make him stay. He would verbally and emotionally abuse me. Call me names. Humiliate me for sitting there for so long and on and on. Finally, I just stopped doing that. It felt so good. Now, he will try that “pretend” type of breakup threat you are talking about and I will say, “Yes. You have that choice.” I then finish up whatever it is I am doing around his area and say, “See you later.” I guess I use a form of semi-contact for my own purposes and then a form of semi-contact mentally as time has gone by. It is very difficult for me to fall for anything he does or says or is as if he is a whole human being. I very rarely get fooled by whatever he is any more. But, you are right. He sure does try every angle. It’s very interesting to see how desperate they can get at their attempts to win us back or try to fool us back into another round. They will try anything I find. I think you are right on target here. Even though I still feel discarded, the beginning of my end with spath was initiated by my coming to him and telling him I was leaving beacause I needed time to think things over. I suspected he was heavily involved with OW, I turned out to be right. The major point though is that somehow he turned it all around on me. I was the one left crying at the end. I let him twist me into knots and longing. I also think spath’s begin a discard when they have grown bored or we are not fun anymore, or in my case, needed his help and support with a problem in my life. Up until I needed his help, I was the “love of his life”, and the OW only had him when I was busy. LOL So his discard was passive agressive, he just did enough unacceptable behavior that I had no choice to see that there was a problem. I also attend 12-step program’s, and tried to institute healthy relationship boundaries with him, I was very ineffectual with him, he over-powered my best attempts at normal conversation and interaction. He was smart and much more dominate than I. I caved, rolled over. I like the idea that you have raised, maybe we are discarded because of something in us that was a striving to reclaim what we know is rightfully ours…the right to be treated with love, honor and respect. When I said those type of things to him, he actually told me he had treated me very well, better than any other woman before me. Now, that was down right funny! When I enforced healthy boundaries, the spath went into an ice cold rage and tried even harder to scare me. I was shocked. I thought he’d go away when he realized he couldn’t manipulate me. My spath was criminal, but with his money and connections, he got away with so much blatant crime I’m still shocked years later. 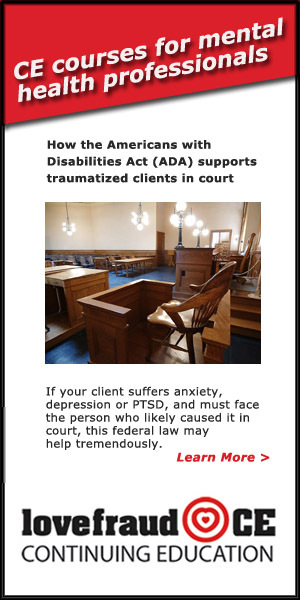 Some professionals say it’s fine to act – not be, but act – submissive or bore the spath into leaving us alone. I’m so glad to read that you could laugh at yours! Kudos! Yes, we can turn it around. They leave when we make it clear we are fed up. Sometimes we are just so tired of it, and we are really speaking up in a safe way, but we don’t realize that they can see a glimmer of strength and they don’t like it at all. That glimmer is like being shown the door for them. 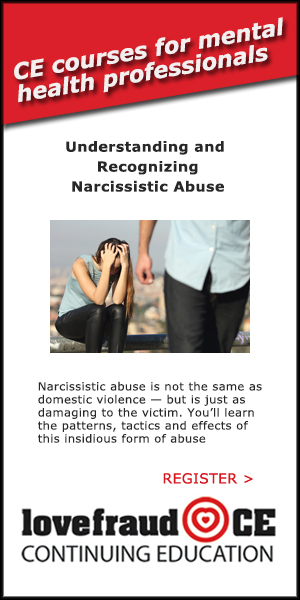 In the research I’ve done and the books I’ve read, ANY attempt (even small) at human communication with a narcissist/spath is received, THEY see it as an assault upon their illusion. They live in an up/down/win/lose reality and we live in a communication/loving/compromise reality. Your decision to question his reality was your way of telling him he had lost and to get lost in his type of thinking. I can tell you, from experience, they consider they have been disposed of when you want equality and your needs met. I can also tell you that it would be very difficult for you to go back once you stand up for yourself. They find strong people, work at weakening us, and then they have lost the “game” if we regain our strength. Yes,you are spot on! If the sociopath tries to get us back (lovebombing),it is only because they don’t want to be the one who has been discarded,and they want revenge! Hi Blossom: As you know, I see my spath almost daily. I’ve reached a point where I laugh inside when he tries love bombing. It is so transparent once you know it for the phony and empty manipulation it is. It is hard sometimes not to say, “You really think I’m taking this BS in, don’t you?” But, I just look at him, say thank you and count the days until rent day! Yep, once you have been educated in their evil ways you can see right through their games. I quite enjoyed our little meetings and watching the classic moves he made to keep me as one of his “reserve” sources. TBH I kept in touch hoping to witness his eventual downfall whilst keeping him thinking I believed his lies. He met his match eventually and his downfall was very satisfying to see. Of course there will be others but he’s 62 and drinking heavily and I believe he will find it difficult to find another victim in the small community he lives in. My counsellor told me that as he gets older and less attractive the length of his relationships will become shorter and shorter as he becomes more and more desperate to find more victims. My idea about what drives a sociopath to discard us is maybe a little different. Because I think we have nothing much to do with what happens, in the most final sense. I think we all made attempts at communicating our needs, concerns, and objections. All of us here have some level of self-respect, and a real desire to nurture imtimacy with those we love. This includes ‘working’ on the relationship when it is struggling. And this is certainly highly irritating and insulting to sociopaths. But I think that, like most everything that exists outside of their disordered thinking, we have little impact on their behavior. Really, I think, even before the first sign of our dissatisfaction, they are actively discarding us. Because, and this is so weird to me even now, they are never WITH us. They are always NOT a part of our lives. They are in the cycle, with discard as the ONLY outcome, at the first ‘hello’. Even if it took years, and we got caught in the cycle of abuse with them. 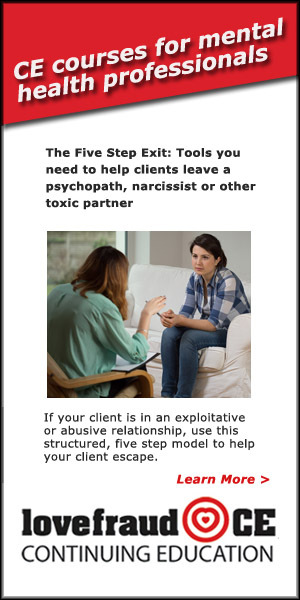 They cannot do any relationship outside of the sociopathic cycle. Even the most ‘perfect’ partner will be abused and left (if not physically, then psychologically/emotionally/spiritually). I think, and this is completely hypothetical since it can never actually happen, that if we were able to, at every turn, totally fulfill their whims and fancies we would still be shunned. Because I believe they also can’t stand us loving them. They don’t understand love, comittment, compassion, and loyalty. So they disdain it. The have nothing but contempt for our SHARED humanity, that they feel apart from. And I think our attempts at saving the relationship, even when we are critical of it, is just another expression of our love (for them, for ourselves, for intimacy). They hate what they cannot feel and understand. So, we are hated from the start, and the only thing they are doing, the ENTIRE time they are with us, is settling a score that only exists in their experience. I kicked the spath to the curb. Never spoke another word to him. But he, from the beginning, was always getting rid of me. I am OK with this. Because I understand that he could not do anything else. He will do it with everyone, forever. It wasn’t personal, and had NOTHING to do with me. Ever. When the truth of his sick disordered mind really became real for me I didn’t care that he conned me the whole time. I didn’t care that he had new women, while he was with me. I didn’t care that some people still thought he was awesome. I didn’t care about the $. I simply stopped caring anything about him at all. It was a place of peace to find this not caring. Very interesting points, Slimone. I think your take on the early discarding as soon as we act human is quite right. Actually, I think most of us find that they have one or more victims on all the burners at all times. Sometimes we are the one on a back burner and sometimes the others are. I believe it is entirely possible mine still has contact with people he knew long before he ever met me 18 years ago….other people he can use as if they are items instead of human beings. I also think they never stop searching on the different “hook up” websites. When I had to take mine to a VA hospital a couple of months ago in an emergency situation, I kept his phone because it was a long distance call and I don’t have long distance at home. Before I even got home from the hour long drive after dropping him off, his phone beeped and it was a text from a (I know now after getting home and researching online) very well known hook up site. It is free and it is supposed to connect you to people in your area. The person wrote “Hi.” I wrote back, “Go F yourself.” They wrote back, “Are you in (name of city he hasn’t lived in for two years)” and I wrote back, “Go F yourself,” and turned off the phone. After I got home and saw it was a free site and that a lot of scammers are on it. However, because these types of people are so stupid, it is very popular globally. It was another moment where I realized he is always on the hunt. With no car, no money, walking with a walker, and a catheter in full time! Still on the hunt. I can only imagine the lies on a profile he would create. He then bought another type of prepay phone which isn’t working out too well. It has cost him more than the other phone. He tries to come and knock on my door instead of calling and I pretend I never hear it so he has to call. So now he is talking about using the other phone again and he will get a new phone number. He is supposed to do that on the 1st, but he is soon going to be in the hospital again and I will have his phone again. I am going to enjoy seeing what happens as time goes on. He is going to be in and out of the hospital many times until he finally goes from falling apart to dying or needing full time care. I guess he will have to find a reason to change his phone number every time! THEY are the ones who get exhausted when they get sick and old. I once had an Al=Anon sponsor who told me she found a way to observe her alcoholic without getting emotionally involved in his nonsense. She said, “I just pretend I am one of the wild rabbits that hide in the bushes in our yard.” She said that the bunnies just watch and observe from the outside of things. That is what I try to do with him more and more. I am not looking for love at this time. I am older and just need to survive. If I was young and was on this site and knew I was with a sociopath, I would run as fast as I could. I would find any excuse to get one out of my life and I would look for love because you are right. The actually BEGIN a relationship discarding people. You are fortunate in that you can let “it” roll off your shoulders like a duck lets water roll off it’s back.The situation I was in didn’t allow me to co-exist with spath as he was doing his best to exhaust me to the point to where I was no good anymore. I woulda loved locking a door in his face knowing the rest of the house was ALL MINE and spath couldn’t bother MY SPACE! What you said about spaths not wanting to commit to us from the beginning,may very well be true.There was a purpose;a scheme.They set out to achieve it using us,but if we were never needed,we would never have been in the picture! That means my spath is caught between a rock and a hard place because he is trying to “infiltrate” the congregation and appear to be a spiritual man….a wolf in sheeps clothing.As such he has to be very careful to appear righteous.That would have been easier as a younger and healthier man.I think it’s about to crumble down around him. I hear you. They do use us to get what they want…So, they ‘need’ us to be a part of their twisted cycle as far as that goes. We are involved in their cycle as prey. It’s all as you said, a scheme. Each little piece of the game is enacted to get them the goods and services they need to survive and enjoy themselves. My experiences were also that the Idealize, Devalue, and Discard phases of the sociopathic cycle were not linear. Rather they happened all at once, and were happening at different times during the various lies/scams he was pulling on me. In one sentence he would be devaluing me (because he was trying to cover an affair, and make me feel insecure so I wouldn’t probe too far), and the next sentence he would be idolizing me (because he wanted my password information for my 401K), and then an hour later he would storm out in a kind of angry fit, threatening to break up, read: discard (because he wanted to go somewhere he knew I wouldn’t approve of). He would go through these ‘tighter’ spirals of the cycle over and over and over. The relationship NEVER stabilized, and was always chaotic. In truth, by the time he had run his game to the point that I wanted out, he was just doing a bigger, more theatrical, version of the discarding I had experienced the entire entanglement. I didn’t push him into finally discarding me. This was all a game, a compulsion he had played out for his entire life. When that really sunk in I felt SO much relief. Then I knew I could have been anybody and the same thing would have happened. I could release myself from blame for not being ‘good enough’, or any of the other lies he told me. Then, I was ‘just’ responsible for learning as much as I could about myself…..an easier task, I dare say, than dealing with a sociopath! And, Blossom, depending on how adept the guy you were involved with is he may succeed in infiltrating your church, or may not. Some will like him, some will smell a rat. Just like us. Not much any of us can do about it except move forward and create truly authentic lives for ourselves, with people who cherish us. That’s more than all the spaths combined will ever achieve. What HE THINKS he looks like to the congregation, and what THEY THINK are two different things! He still catches me by surprise as they do sometimes. It hurts, but I just walk away faster than I have in the past. I can highly recommend creating your own space they can’t get into. Putting a door into a master bedroom or den, throwing in a fridge, a hot plate, a microwave, and putting up some plywood in a hallway and you create two living spaces for a few hundred dollars. I have always had a room mate to help pay those house payments. This is the second time it’s been him. I am fortunate in that I chose not to marry him although he asked many times and I own the house entirely. I have had this large “den” room and full bath separate for years. When he first moved in again a couple of years ago, he had a key to my area, I was going to let him use my car, etc. I thought it was love and he had changed. As I saw he was the same person as before…maybe worse, I took those options away from him. It is not ideal, but it will get my house payments paid for a while. He will truly be lucky if he makes it through his next surgery. I will mourn him when he is gone…the part of him that “acted” normal…but after grieving, I believe I will have some release from the choice I made to allow him back into my life. He started with the love bombing three years ago and I fell hard again. But, over time, as I see the real him, that person I thought was showing me love and respect died. THIS person is alive and paying rent. It’s sad, but as I’ve said before, he overpays and my choice has been that it is worth it. Maybe it is and maybe it isn’t. But a girl’s gotta do what a girl’s gotta do and I am fortunate that I can go days without seeing him or talking to him. I know getting back with a Spath is doomed and the outcome can only be bad, but I have allowed him back into my life (and bed) He denies he’s a sociopath, but fits the criteria, he’s gone for therapy, moved out from his partner ( the one I didn’t know about for a year) and claims I am the ‘love of his life’. I don’t believe most of the stuff coming out of his mouth and I know my friends and family think I’m a fool for seeing him. I don’t feel love towards him and am actually indifferent, I’m a bit lonely and bored and seeing him once or twice a week is better for me than being alone. I know I will not fall under his spell again and he certainly doesn’t seem so exciting and special anymore. He’s quite pathetic and needy and I can see that. I feel quite cold towards him. I don’t know if this is somehow part of the process of healing for me. I’m going for therapy myself to look at why I’ve been involved with men who will betray me. I can see that continuing to see him is a form of self-harm, part of an addiction, but the Spath that I was addicted to does not work for me anymore. It’s an unhealthy habit and an uncomfortable one, but I’m not yet ready to give it up. I’m getting a source of pleasure from being cold to him, from knowing that he thinks he’s getting me back and me knowing that I don’t feel anything towards him. It’s like a sick game where nobody will be a winner, but I’m right in the middle of it. Hope you will continue to share. Recognizing them for what they are is part of the unveiling path. Some here choose to keep them in their lives and some choose no contact. I choose some contact as you do. I have only read of one case where the sociopath was willing to look at the criteria, admit he was a sociopath, and discuss it with a victim. Most of them live to make you think you are the crazy one. I think detachment works well…especially if they are ragers. Mine tries the raging and I walk away. Ihave a very unique situation, though, and would never be able to have a relationship with him that you and I would consider the norm. They are just Good Time Charlies with multiple victims until their good times end one day. For me, that mental distance is very important. Hi TI: “Hit me. Hide me.” I will keep that one in my brain. When mine starts to rage, I now say, “I am too good for this kind of treatment. You will need to go yell at yourself now. I have only calm, rational discussions with adults.” He always comes back with, “It’s because…” or “Well, because…” I now quickly come back with, “There is no “because” for raging and abuse.” No because. I then say, “I am leaving now. OK. Bye.” and leave with him raging. If he is in my part of the home, I say, “I need you to leave now. I don’t accept raging as a form of communication any more. Bye. OK. You’re leaving now.” and I get up and walk to the door. Mine is old and infirm, though. I don’t know if that would have worked when he was younger if I had been informed enough to do it. They will do anything for anything. Yours must be in some big financial trouble to accidentally pull in to “con hits” for the same night! Glad you saw the humor in it. It is not you, it is HIM. And the more we know that deep within ourselves, the better we will be. It was harder when he was younger in some ways. Now it is harder in other ways. Spaths are just difficult people throughout their lives. That is why the encouragement here is so helpful. I appreciate everyone here. I am sorry for this horrible experience. Lack of awareness and a certain naivete about “evil” is what causes most of us to buy their line of crap. I never believed any one would “intentionally” harm me. Well, maybe the guy that lurks in the alley with a knife…but I KNOW not to walk down that alley. I finally “caught” on to my psycho about 8 years ago and started challenging his choices. Slowly, our marriage started to erode. I use the term “marriage” loosely. We never had one, it was an arrangement….for him. The last three years of our marriage he was DONE with me and I with him, but I had become so emotionally ill, I could not make the choices about leaving. This happens MANY times. We get SICK from their SICKNESS. Our brains start reacting and develope a “survival” mode of existence, and we can become frozen in the hell that has been created with this disordered living. Finally, he FOUND his new victim and scooted out the front door. Happy as a clam that he was away from ME – the mean woman. Finally, after much research and support, I realized I had been played for 17 years. I missed all of the warning signs and of course never realized that CHEATERS are liars too. Right? Women like Donna will be making the RED flags of Cluster B personality disorders common knowledge before long, and I intend to do my part. I give thanks daily to my freedom from the emotional prison I lived in for almost two decades. Thanks for sharing your story. I liked the ending…Freedom! It is amazing how we can get physically and mentally ill in the vicinity of a sociopath. It takes a lot of work to keep their evil from infiltrating our very being. You are right. 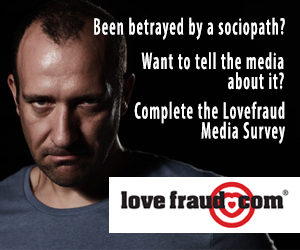 I am also spreading the word about lovefraud.com and as more people learn more about sociopaths, the world has to become a better place! Sorry to hear of your bad experience. It is a long road before discovering the truth and its a hard reality to accept. I feel so robbed of my innocence I don’t think I ever stood a chance it was all I ever knew from childhood really so THEY have been apart of my entire life up until now. 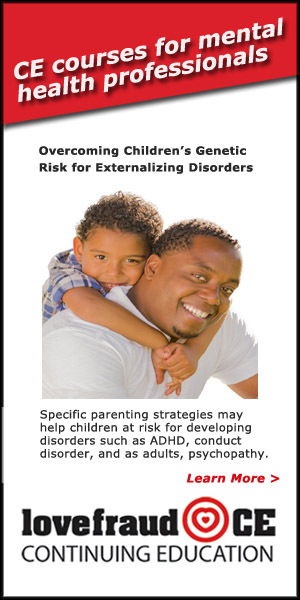 And I have two children that could both have a genetic hand down of this disorder. Life definitely is better off without a sociopath as a partner but when you have a baby with a psycho it gets scarier and messier so you never feel completely free from them. I still feel attached because of my baby and I know he will continue to use this and the thought of him getting custody scares me even more. I hope one day I can get to that place of feeling complete freedom and feeling safe. Thanks for telling your story. I wish you all the happiness in the world. Wow, another terrible story, thanks for sharing it with us. Believe it or not, you can get over this, stay strong! Thanks for sharing it with us. You’re right that they sense a weakness in their victims’ spirit and they do come back to recycle a source. I was thoroughly and completely taken in by my ex but through counselling I was lucky enough to find out what I had been involved in; despite still having feelings for him I was able to see through his games and stay strong. I eventually found out the extent of his evil behaviour when I talked at length to my successor and one of his children; the lies were breathtaking and his treatment of his wife, me and my successor was calculated and cruel. I too could write a book but I wouldn’t know where to start- life is too short. My advice is to go no contact and stay no contact, that way you’ll remain safe from being drawn in again. Stay strong.